Royal Mecca Clock Tower Overlooking the Grand Mosque, Mecca -- Photograph Via Islamic Heritage Research Foundation. Behind closed doors – in places where the religious police cannot listen in – residents of Mecca are beginning to refer to their city as Las Vegas, and the moniker is not a compliment. Dr Alawi's most pressing concern is the planned £690m expansion of the Grand Mosque, the most sacred site in Islam which contains the Kaaba – the black stone cube built by Ibrahim (Abraham) that Muslims face when they pray. Construction officially began earlier this month with the country's Justice Minister, Mohammed al-Eissa, exclaiming that the project would respect "the sacredness and glory of the location, which calls for the highest care and attention of the servants or Islam and Muslims". The 400,000 square metre development is being built to accommodate an extra 1.2 million pilgrims each year and will turn the Grand Mosque into the largest religious structure in the world. But the Islamic Heritage Foundation has compiled a list of key historical sites that they believe are now at risk from the ongoing development of Mecca, including the old Ottoman and Abbasi sections of the Grand Mosque, the house where the Prophet Mohamed was born and the house where his paternal uncle Hamza grew up. 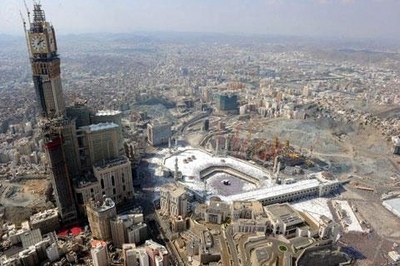 There is little argument that Mecca and Medina desperately need infrastructure development. Twelve million pilgrims visit the cities every year with the numbers expected to increase to 17 million by 2025. But critics fear that the desire to expand the pilgrimage sites has allowed the authorities to ride roughshod over the area's cultural heritage. The Washington-based Gulf Institute estimates that 95 per cent of Mecca's millennium-old buildings have been demolished in the past two decades alone. Those circling the Kaaba only need to look skywards to see the latest example of the Saudi monarchy's insatiable appetite for architectural bling. At 1,972 feet, the Royal Mecca Clock Tower, opened earlier this year, soars over the surrounding Grand Mosque, part of an enormous development of skyscrapers that will house five-star hotels for the minority of pilgrims rich enough to afford them. For ordinary Meccans living in the mainly Ottoman-era town houses that make up much of what remains of the old city, development often means the loss of their family home. Non-Muslims cannot visit Mecca and Medina, but The Independent was able to interview a number of citizens who expressed discontent over the way their town was changing. One young woman whose father recently had his house bulldozed described how her family was still waiting for compensation. "There was very little warning; they just came and told him that the house had to be bulldozed," she said. Another Meccan added: "If a prince of a member of the royal family wants to extend his palace he just does it. No one talks about it in public though. There's such a climate of fear." Dr Alawi hopes the international community will finally begin to wake up to what is happening in the cradle of Islam. "We would never allow someone to destroy the Pyramids, so why are we letting Islam's history disappear?" When the Wahabis took Mecca in the 1920s they destroyed the dome on top of the house where the Prophet Mohammed was born. It was then used as a cattle market before being turned into a library after a campaign by Meccans. There are concerns that the expansion of the Grand Mosque will destroy it once more. The site has never been excavated by archaeologists. For many years, hardline Wahabi clerics have had their sites set on the 15th century green dome that rests above the tomb holding the Prophet, Abu Bakr and Umar in Medina. The mosque is regarded as the second holiest site in Islam. Wahabis, however, believe marked graves are idolatrous. A pamphlet published in 2007 by the Saudi Ministry of Islamic Affairs, endorsed by Abdulaziz Al Sheikh, the Grand Mufti of Saudi Arabia, stated that "the green dome shall be demolished and the three graves flattened in the Prophet's Masjid". A mountain outside Mecca where Mohammed received his first Koranic revelations. The Prophet used to spend long spells in a cave called Hira. The cave is particularly popular among South Asian pilgrims who have carved steps up to its entrance and adorned the walls with graffiti. Religious hardliners are keen to dissuade pilgrims from congregating there and have mooted the idea of removing the steps and even destroying the mountain altogether.